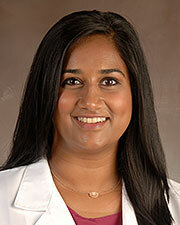 Subhratha Maredia, MD, truly enjoys caring for women through all aspects of their lives. From adolescents and contraceptive care, to caring for women through pregnancy, and maintaining health through menopause and beyond, she enjoys the ability to take care of it all. Dr. Maredia focuses on listening to women and their concerns and making each appointment as comfortable as possible. Most of all, she feels privileged to care for women during their most vulnerable moments in life. Dr. Maredia lives in the Sugar Land area with her husband. Outside of work, she enjoys cooking, exploring new restaurants and spending time with friends and family. Dr. Maredia is a member of the American College of Obstetrics and Gynecology.